The LNG engineering solution from STAHL are ideal for maintenance work in LNG plants. The LNG hoists from STAHL CraneSystems have been designed especially for maintenance work in natural gas liquefaction (LNG) plants. Thanks to their high-quality components and robust design, they are ideal for use near the coast in challenging climate conditions. Equipped with two rope drums, two ropes, two gears and two motors, they are explosion-protected and certified in compliance with the strict ATEX directives and IECEx regulations. The pumps which pump the liquid natural gas into a pipeline system at a temperature of –161°C must be lifted out of the tanks and transported to the exterior for maintenance up to five times a year. The extreme conditions prevailing in the tank necessitate special ropes which are permanently connected to the liquid gas pump and remain in the tank all the time. For maintenance work, these ropes are attached to the wire rope hoist by means of rope clamps, so that no hook is necessary. 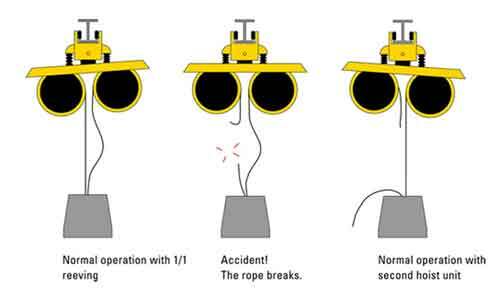 As all safety relevant components are doubled up, the hoisting procedure can continue without disruption even if a rope should break. Only one rope acts as hoisting rope when lifting the pump. The second hoist runs alongside with a dead rope as backup. 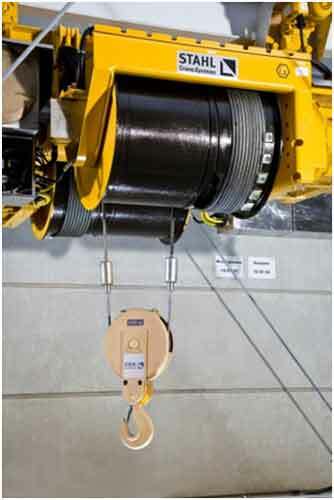 If the load rope should break during the hoisting procedure, the second wire rope hoist carries on hoisting. The shock-absorbing rocking suspension of the hoist cushions the impact of the abrupt load change. Thanks to their redundant design and rocking suspension, STAHL CraneSystems’ LNG wire rope hoists are regarded as the safest hoists presently available on the market. - Constructed from field-proven series components. - Hoist, gear, drum and motor doubled up. - Off-standard ropes connected by rope clamps, special recess in the drum for the rope clamp. - Design minimizes risk if a rope should break. - Integrated load sensors monitor the suspended load. - Reliable, high-performance, low maintenance mechanisms classified in accordance with FEM. - Special-purpose equipment for use in LNG plants. - Approvals to ATEX and IECEx standards.